Industrial-grade fluoride is due to be added to the drinking water of the Southampton area. The consultation showed that 72% of local people were against compulsory water fluoridation. Despite this, the Strategic Health Authority (based outside the area in Berkshire) is determined to push the scheme through before they are abolished in 2012. Is this fair? Is this ethical? Is this democratic? Is Southampton willing to be both the first and last area to be used to further the pro- fluoridation lobby? www.southampton.gov.uk/moderngov/mgEPetitionDisplay.aspx?ID=18&amp;RPID=5121510&amp;HPID=5121510 or go to the website (www.southampton.gov.uk) and click on Your Council (bottom right hand side) and then click on Petitions and then browse All Petitions. THERE’S just weeks to go until a whole town turns green. 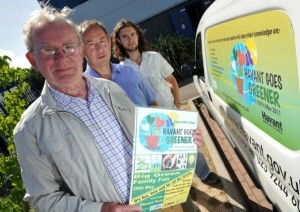 Council vans have all had the green message emblazoned on them ahead of the Havant Goes Greener week. The borough council, along with eco group Havant Transition Network and Friends of the Earth, aim to show how small changes can make a difference. Ray Cobbett, from Friends of the Earth, said: ‘We want to encourage changes like reducing waste, supporting local shops, using the bus or bike instead of the car, buying greener energy and caring for our open spaces. It culminates in Havant Park with the Family Green Fair where there will be music and entertainment alongside dozens of stalls where you can buy green products. The developer planning to build a £300m biomass power station in Southampton has announced it will amend its plans and hold a second public consultation. Helius Energy wants to build the 100 megawatt wood-fired plant at the city’s Western Docks. The firm has said fuel would be “sustainably sourced” and the impact on air quality would be “negligible”. But campaigners against the plan say the plant would be “visually intrusive” and increase transport congestion.